Sometimes you don’t realize how much you appreciate a feature until it breaks. One example is Outlook email links. It’s so convenient to click the link in the email and have the correct web page open. What I dislike is when a hyperlink in Outlook doesn’t open and I get some error or no action. Below, I’ve listed 4 solutions to this problem. Why Do Links Stop Working in Outlook? Over the years, I’ve not found what process causes Microsoft Outlook links to break. The last time, the URL links broke after I did a Windows update and installed an Internet Explorer beta. Because I didn’t test Outlook email in between the downloads, I couldn’t tell you which activity contributed to the problem. Microsoft also has a global setting that disables hyperlinks by default for email items classified as junk. The setting is under Home | Junk | Junk E-mail Options…. This setting is designed to protect you from phishing attempts and malware. If you click an email, you should get a security warning message telling you the message has been converted to plain text and links are disabled. To resolve this issue, drag the email from your junk email folder to your inbox. Microsoft has added a “Fix It For Me” page for this problem. I like these solutions as they tend to make it easy to fix this annoyance. One caveat is you need to use this page from the computer with the problem. Just go to https://support.microsoft.com/kb/310049. Most times, I can fix my Outlook hyperlink problem by resetting my default browser to Internet Explorer. I start with this step even if I plan to use Firefox or Chrome as my browser. The reason I choose this path is I’ve had better success and it takes me closer to my end goal. And if I call Microsoft, they will want me to change to IE or Microsoft Edge anyway. Click Tools from the menu. Click the link labeled Make Internet Explorer the default browser. Test a hyperlink in Outlook to see if the web page opens in Internet Explorer. Note: After you’ve tested your hyperlinks, you might want to go back and change your default browser if you used something other than Internet Explorer. Even after resetting your default browser you still can’t open the hyperlink in Outlook, it could be one or more registry keys is damaged. The solution is to reregister some of your DLL files. The process may sound intimidating, but it’s easy. There are 6 files to register based on your version. Some configurations use shdocvw.dll and others use shdoc401.dll. 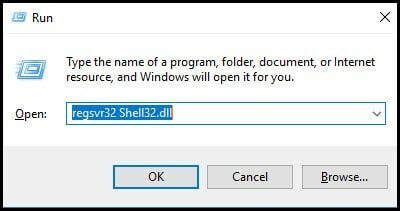 In the Open: textbox, type regsvr32 followed by a space and the file name. Click the OK button. You should see a message showing the process succeeded. Repeat the procedure for the other DLL files. As before, test to see if your Outlook hyperlink problem has been resolved. If you’ve gotten to this part, I have to figure your Outlook hyperlinks are still broken. Don’t fret as I have another fix to try. My guess is someplace along the line your file associations broke. This is the mapping Windows uses to associate a file type to program. A common mapping might be .XLSX files with Microsoft Excel. In this case, we need to check HTTP mappings. Press your Windows key + i. This will open your Settings panel. In the Find a setting textbox type Control Panel. Change the View by option to Large icons. 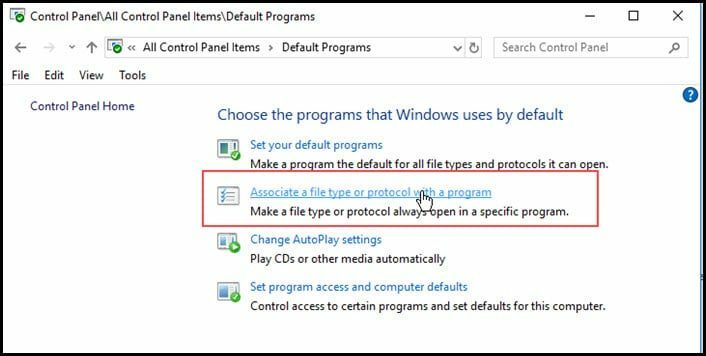 Under the Choose the programs that Windows uses by default select Associate a file type or protocol with a program. Scroll down the Default apps column. 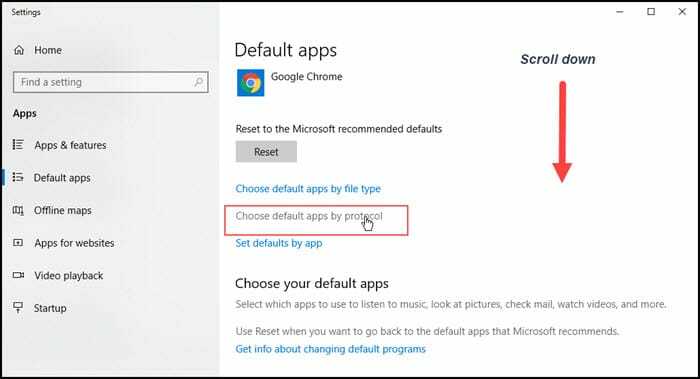 Click Choose default apps by protocol. 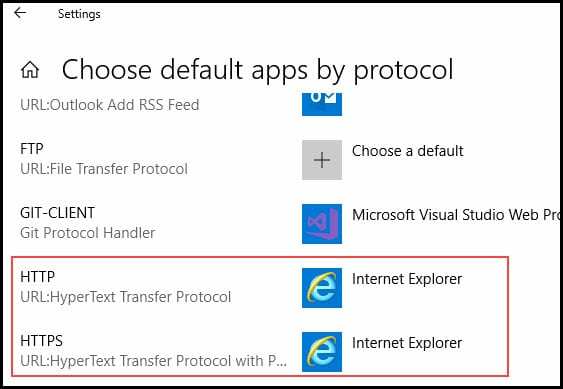 Under Choose default apps by protocol scroll down to HTTP. Make sure your app is set to IE. 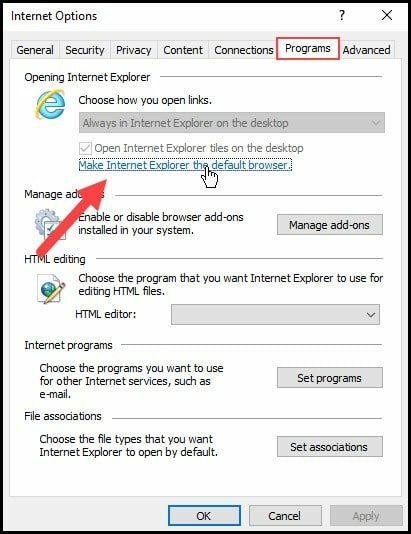 Once you get the Outlook links to open in Internet Explorer, you can change your default browser to Firefox. This should roll down to Outlook so any embedded hyperlinks will open in the correct browser. Under the Startup section click Make Default. If this step doesn’t work, you might check the Mozilla Knowledgebase article, “Setting Firefox as the default browser does not work”.